Using the hand holes you can reach through to see objects in the center magnifying glass. What a great opportunity to teach children to look closely at ordinary or extraordinary things. 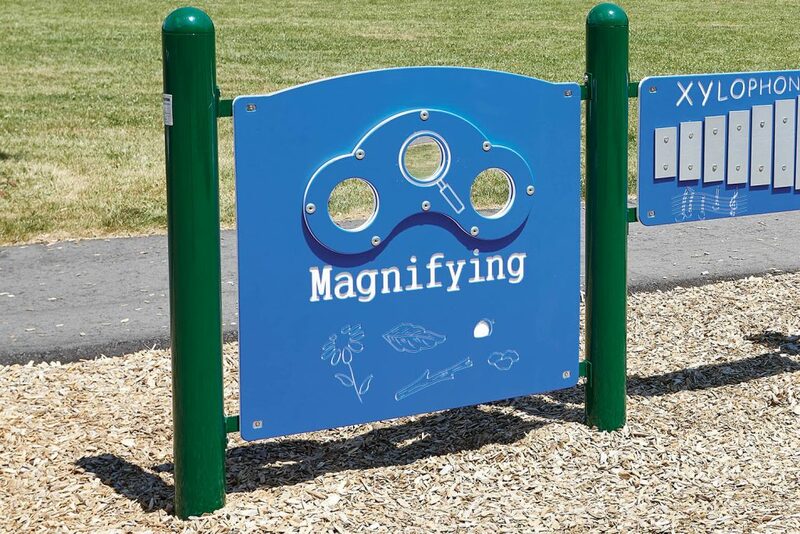 Magnifying Panel is a mechanical assembly of panel brackets, magnifying sheet and panel. Panel brackets are a welded assembly of 0.1875” x 1.75” (5mm x 44mm) zinc-plated hot-rolled mild flat steel. Panel brackets are powder-coat painted. Panel is 0.75” (19mm) bi-color sheet polyethylene.